Since 1952, the first Thursday in May has been designated as the National Day of Prayer. The National Day of Prayer shares common roots with the celebration of Thanksgiving; both were national proclamations establishing a day of prayer, but in the New England Colonies under British rule, traditional observances in late fall called for prayer and thanksgiving, while observances in the spring or summer called for prayer and fasting. The fall observance was established by President Abraham Lincoln as the official Thanksgiving holiday in 1863. The spring observance was established by President Harry S. Truman in 1952 as the National Day of Prayer. In January–February 1952 during the Korean War, the desirability of a united national prayer was stated by Reverend Billy Graham, who said, “What a thrilling, glorious thing it would be to see the leaders of our country today kneeling before Almighty God in prayer. What a thrill would sweep this country. 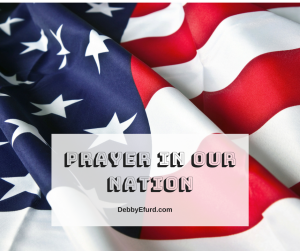 What renewed hope and courage would grip the Americans at this hour of peril.” Representative Percy Priest from Tennessee observed that Graham had issued a challenge for a national day of prayer. Members of the House and Senate introduced a joint resolution for an annual National Day of Prayer, “on which the people of the United States may turn to God in prayer and meditation at churches, in groups, and as individuals.” On April 17, 1952, President Harry S. Truman signed a bill proclaiming a National Day of Prayer must be declared by each subsequent president at an appropriate date of his choice. Every year the number of nationwide events grows with 2018 topping more than 44,000 events across all 50 states. Prayer brings people together. Prayer builds bridges between opposing persons and even political parties. Prayer reminds us that we are created in God’s image and He desires for us to represent Him everywhere we go. Prayer brings UNITY by changing the person praying as well as the one being prayed for. Remember, prayer begins with the one praying. We need it, our nation needs it, the world needs it!